Hot. Fudge. Cake. Need I say more? This moist and lucious cake makes it own sauce while it bakes. Tasty and talented! 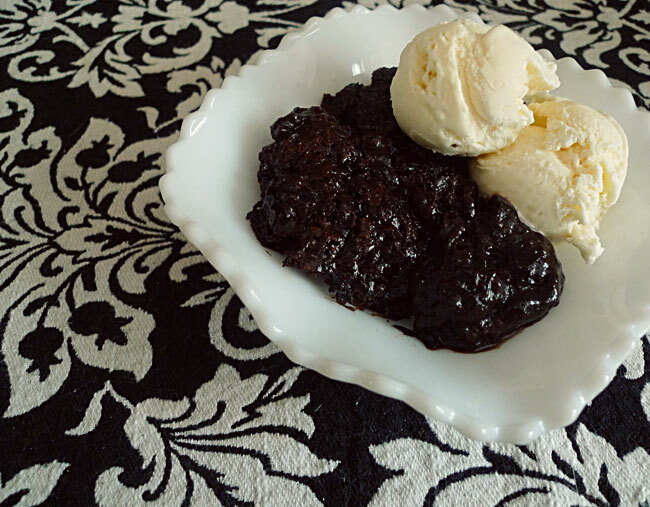 This dessert is perfect for any time of year, great for fall and winter since it's served warm and perfect in summer with a side of ice cream. This is definitely one of my go-to recipes, it's always a crowd-pleaser. If we're at someone's house for dinner and I've been asked to bring dessert, I whip this up quick before we leave, grab some ice cream on the way, and pop into the oven when we arrive. By the time we've finished eating, it's done and ready for us to devour. Preheat oven to 350. In a medium bowl, combine flour, sugar, 2 T. cocoa, baking powder, and salt. Stir in milk, oil, and vanilla, mix until combined. Spread in an ungreased 9-10 square pan. In a small bowl, combine brown sugar and remaining 4 T. cocoa, sprinkle over the top of cake batter. Pour hot water over all of it (do not stir) and bake for 35 minutes. Once baked, let the cake cool for 15 minutes, then serve warm with ice cream. Note: Before it is baked, this cake looks very strange... all powdery on top with puddles of water. But do not be scared. Once it's in the oven, the magic happens. The hot water sinks down through all the layers and forms this rich fudgey sauce, the cake part stays very moist, and the top get's a little crunch from the sugar crust. It is perfection, you just have to trust it to get past the weird looking stage. I may or may not have eaten this for breakfast the past two mornings. Why am I not eating this right now! Looks FABULOUS Erin! I am eating this RIGHT NOW thanks to my friend Jeanne who saw it right here yesterday! Totally fabulous. Everyone should make it! Yay! Glad you are enjoying it! I made this for my roommate's birthday on Sunday, because she didn't want a cake mix cake, and it was AMAZING! Everyone loved it. I love trying out your recipes! Thanks, Meredith! So glad it was a hit!